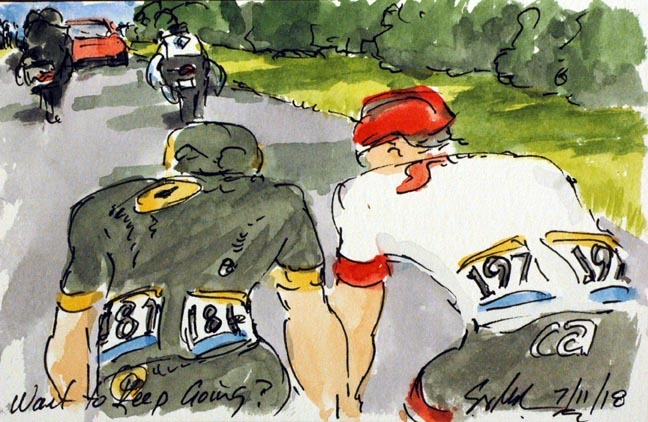 The Art of Cycling: Tour, Stage 4: Want to Keep Going? As the break away started up the next climb, they caught and passed Chavanel. But it was his teammate, Lilian Calmejane (Direct Energie) and Toms Skujins (Trek-Segafredo) who fought it out for the points on the next climb. Unfortunately for Chavanel, Calmejane wasn't able to take the maximum points so it leaves Skujins with a chance to equal Chavanel's total on the final climb. Spoiler alert, he was able to claim that climb and the Maillot a Pois on the day. The discussions continued all of the way to the line, each rider complaining that the other wasn't doing enough to futher their cause.